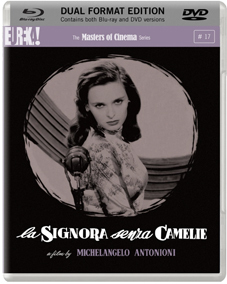 The second feature film by cinema master Michelangelo Antonioni, La signora senza camelie (The Lady Without Camelias), expanded the expressive palette of contemporary Italian movies, demonstrating that a personal vision could take an explicitly poetic tack; that "seriousness = neo-realism" was perhaps already turning into something of a truism; and that Antonioni would answer to no-one but himself. It's the story of a shopclerk named Clara (played by the captivating Lucia Bosé, also of Antonioni's brilliant debut feature, Cronaca di un amore) who finds a chance casting in a small movie role develop into a full-blown career as screen-siren. Tension erupts when her husband can no longer tolerate watching her frivolous cinema escapades, and pushes her into a "serious, artistic" production of the life of Joan of Arc... whereupon she is castigated by the critical establishment. A riveting 'behind-the-scenes' show-business drama, La signora senza camelie explores themes that would haunt its director from L'avventura through La notte and The Passenger – the tenuous hold of an individual on her identity, and the dangers inherent to performance, in life and on-screen. A lengthy booklet containing newly translated critical pieces about the film, excerpts of interviews with Antonioni, and a lengthy debate between Antonioni and critic Luigi Chiarini on the subject of the film.